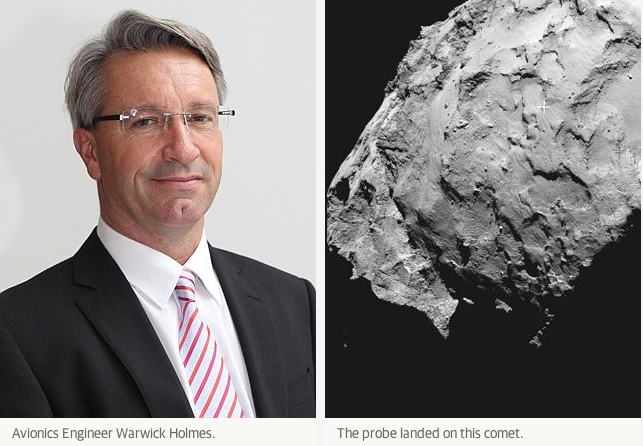 An Interview with Warwick Holmes Aero-space Engineer, Rosetta Project, ESA! 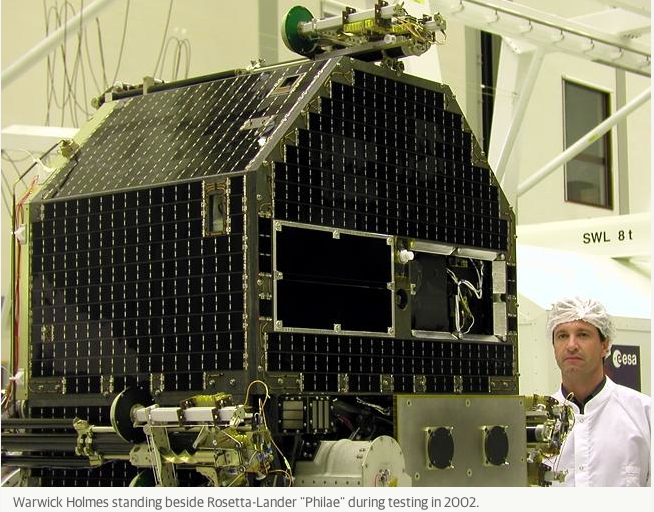 Warwick Holmes with the Rosetta lander 10 years ago!!!! 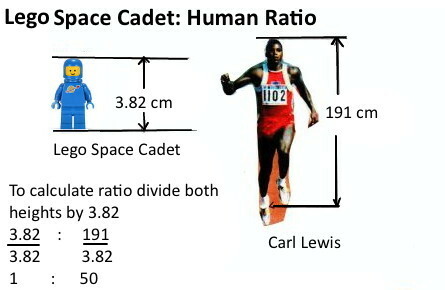 What is an aero-space engineer? An Aero-Space engineer is responsible for turning an “idea” or a “need” into physical reality by creating an “hardware” or “Software” Engineering solution. 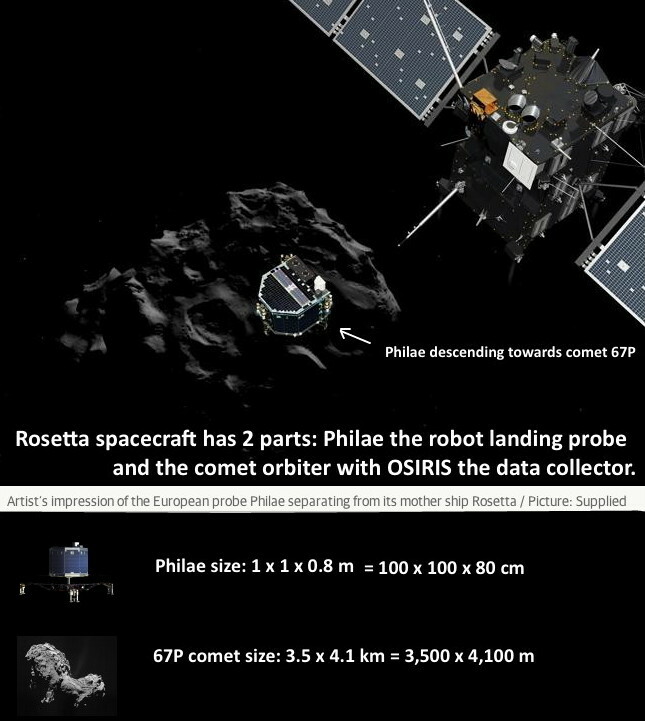 In the case of the ESA Rosetta and Philae mission, the “idea” was to make a spacecraft to orbit and land on a comet outside the Asteroid belt. Aero-space engineers turned that idea into the physical reality of the Rosetta and Philae spacecraft by applying Science, Technology, Engineering and Mathematics to create the spacecraft. 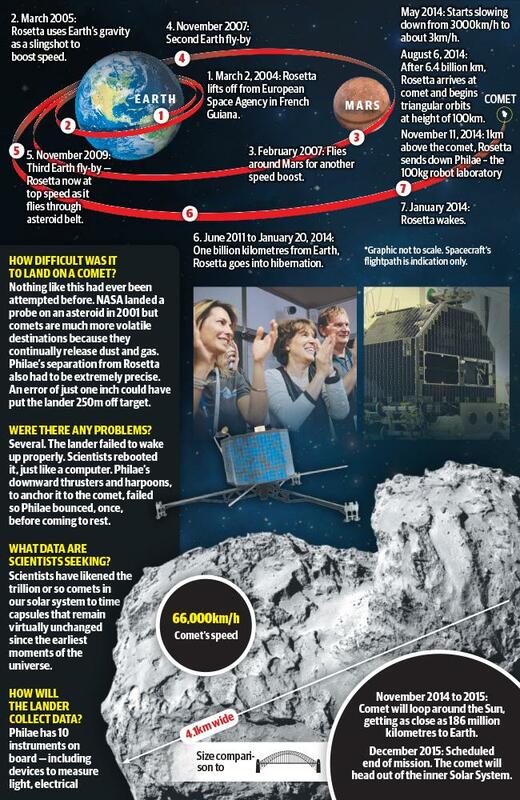 Rosetta then flew for more than 10 years through the solar-system on an interplanetary trajectory, four times around the Sun, a total distance of 6.5 billion km to successfully orbit and land on Comet-67P. What got you hooked on Aero-space engineering? I saw Neil Armstrong stepping on the Moon when I was only 8 years old on a flickering black & white television set from my Grade-2 class in Adelaide. From that moment, I was determined to work in space engineering to build spacecraft and experience the excitement of space exploration and science. What maths did you like? I liked everything about mathematics, I like solving functions (polynomials) and differential calculus. What maths did you hate? Were you a nerd or simply a student with a passion? How do you become an aero-space engineer? What maths do you need? It depends what stream of engineering you choose, but the most common mathematics involved in Space Engineering includes: Matrix algebra, statistics, conformal mappings and complex transformations, differential calculus, Fourier analysis, Laplace transforms and series expansions. 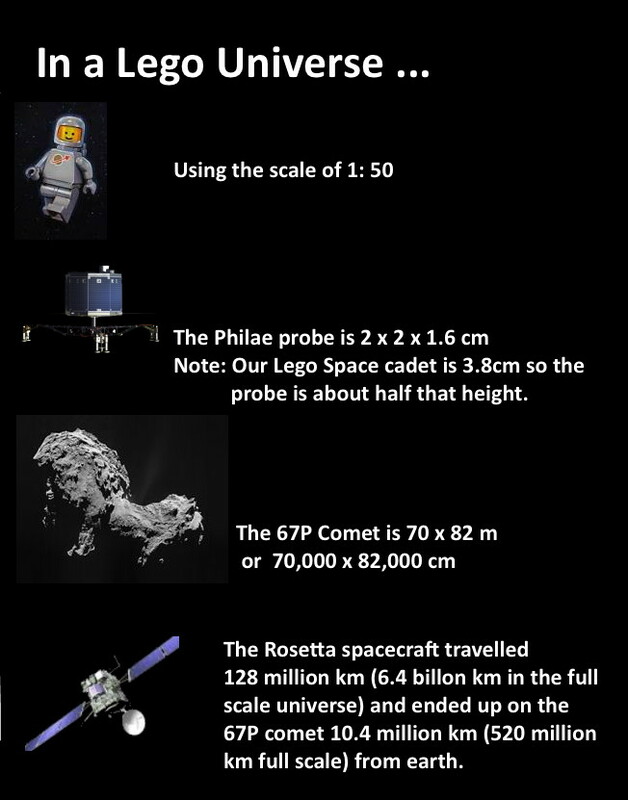 What was your job on the Rosetta project? (2) Avionics Systems Engineer with the European Space Agency – performing complete integrated system tests of the spacecraft mission operations. I performed the initial electrical integration of several electronic units on the Rosetta spacecraft (NAVCAM, gryoscopes, reaction wheels, Antenna pointing mechanism, etc). 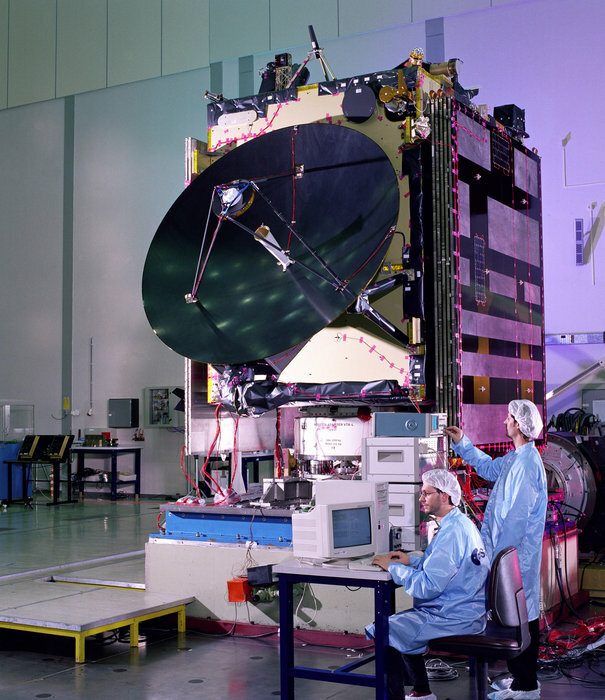 Then followed complex system testing where as many of the spacecraft modes and functions were tested as possible. After several years of testing , the engineers follow the spacecraft to the launch site to launch the spaceraft for the start of its long mission. What was the biggest challenge in the entire project? The spacecraft has a lot of built-in software “intelligence” so the it can look after itself when very far from Earth. 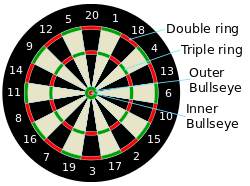 This software was very complex and difficult to understand the decisions and actions it was making sometimes. Getting all the systems working together in one spacecraft was difficult. During the testing 100’s of things were wrong, and that was our job as test engineers to find (hopefully) all the errors before launch. The design of the spacecraft has a lot of flexibility in the software ad hardware which means even after launch many problems can still be solved. This project will potentially prove two very important and currently unknown questions here on Earth. (2) The reason life started so quickly after the oceans formed was because the comets also seeded the water with exotic carbon compounds (specifically amino acids) that gave the formation of life a big kick-start. What advice would you give to any student who wants to be an aero-space engineer? There is only one secret, work hard and do as well as you can because there are many others people who want to do the same work. The only thing managers want to see and that is you are doing good work and working well in the team with other engineers (scientists, mathematicians, etc). 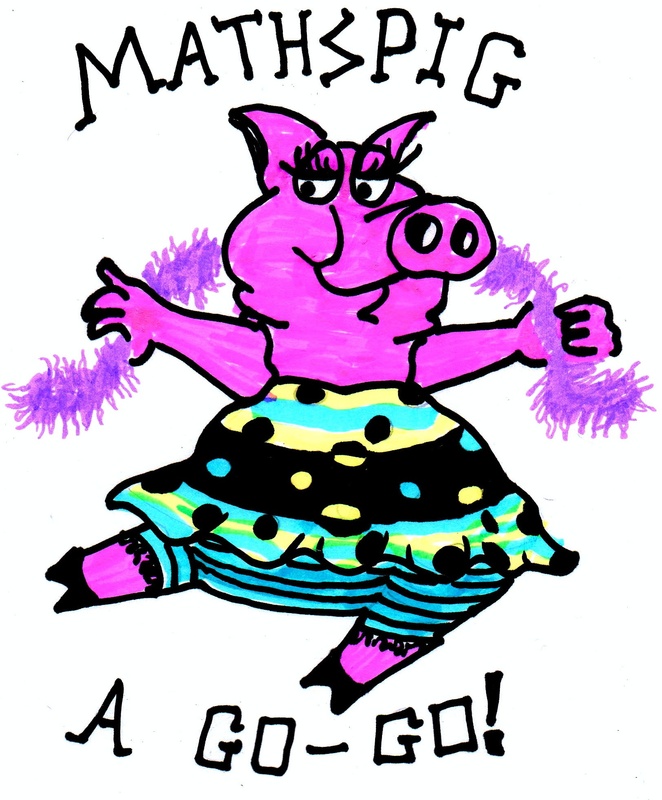 Warwick Holmes, for your dedication to maths and to inspiring the next generation of young aero-space engineers, you are declared an HONORABLE MATHSPIG. The images were taken by the OSIRIS-Narrow-Angle-Camera on-board Rosetta spacecraft orbiting 15.5km above the surface of Comet-67P. They show the Philae trajectory before and after the first touchdown, which occurred at 15:34 GMT (12 Nov). 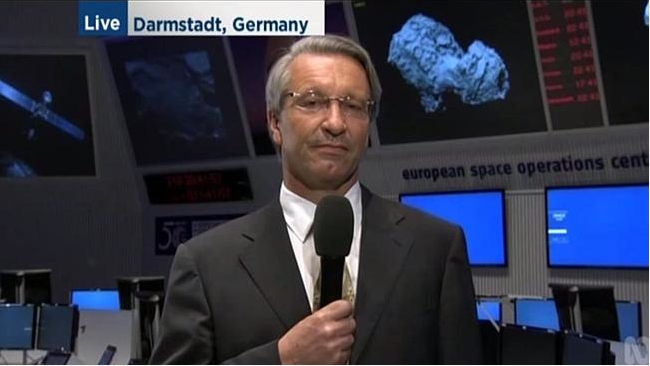 As previously reported the harpoons did not fire into the comet to hold Philae down. 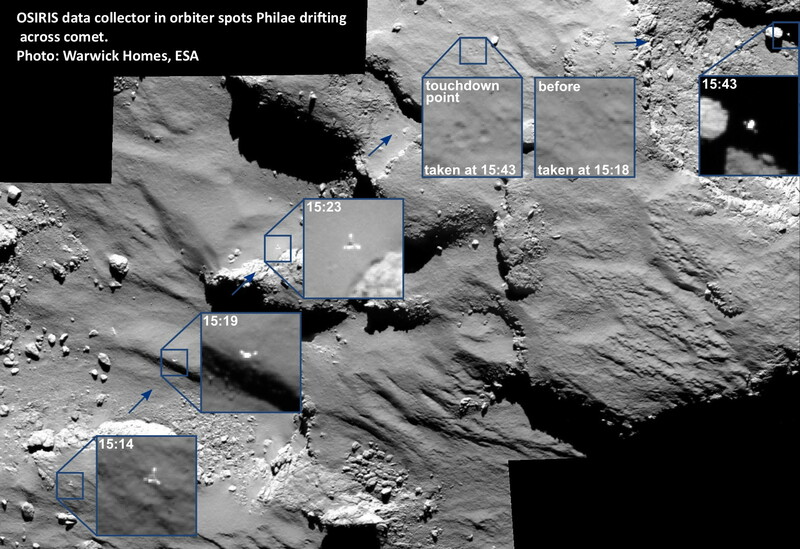 The small inserted images show the imprint of the three Philae foot-pads left in the dusty surface of the comet (compare “before” 15:23 image and the “after” images at 15:43) Philae first touchdown was at 15:34 GMT. 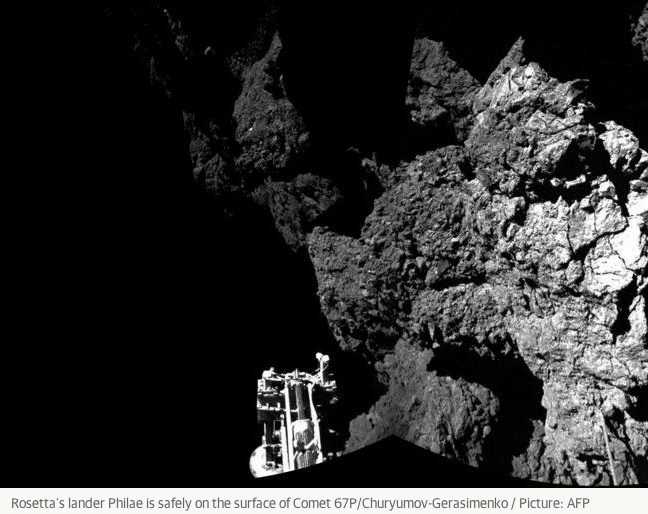 Philae bounced off the comet surface after the first touchdown and remained “airborne” for 1hr 50min. The first bounce was 1km high and went 1km directly east on this image. 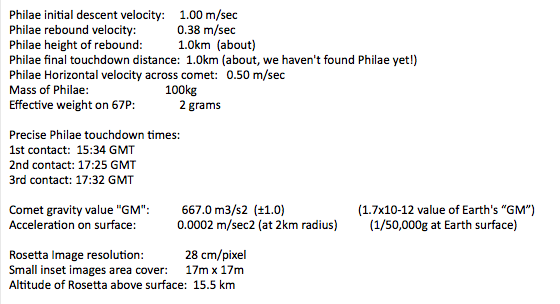 Philae then touched down a second time resulting in a much smaller second bounce which lasted only 7 minutes. The gravitational force on the surface of Comet-67P is 1/50,000th of (“g”) Earth’s gravity, hence the very high and long re-bounds. This image does not show the second or final third touchdown positions as they were outside the field of view of this image as Philae continued heading east with respect to this image. Finally, Philae completed 100% of the science data acquisition sequence that was planned on the surface despite the “rough” landing(s). It will probably be several months before exact scientific findings are being published as the scientists shall be spending many weeks processing and examining the plethora of scientific data from Philae and Rosetta over the landing site. This is fabulous. Live Comet up date here. 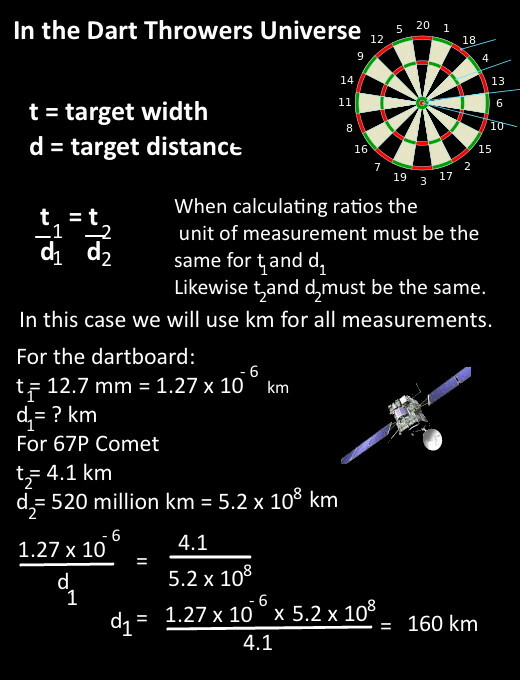 More Rosetta data from Warwick Holmes, ESA. 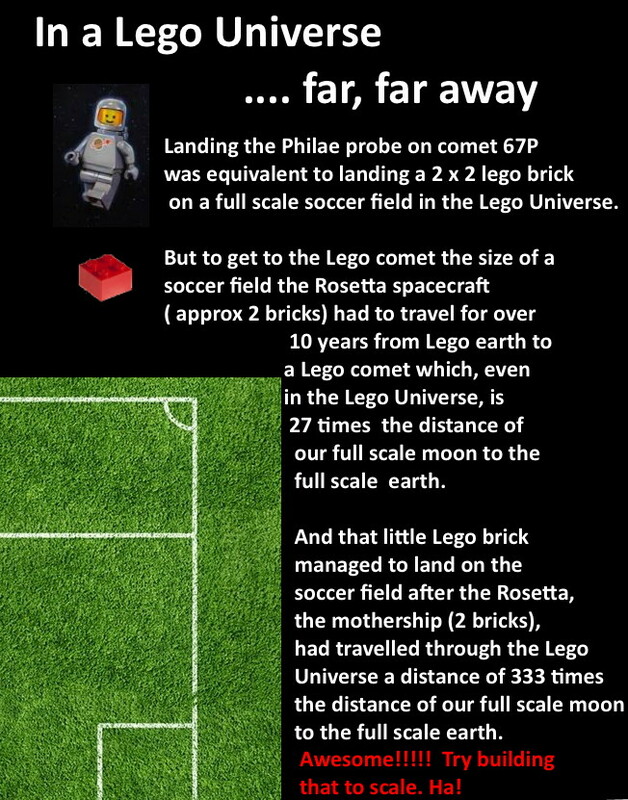 Did they get the maths right? Actually, hitting the 67P comment was more like roulette as the Rosetta mothership swung into orbit. And, as the earth and the comet are moving, the distance constantly changes, but you can watch the distance changing here. 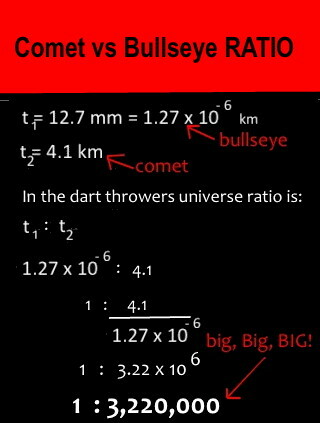 We will assume someone can stand on earth and throw a dart at the comet … Yes! They would need very big triceps. So the commentators aren’t even close. 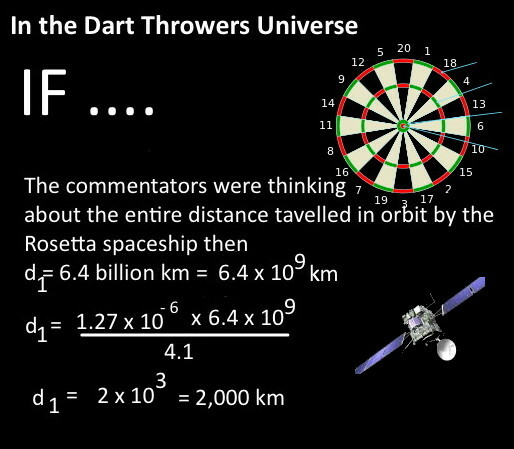 It would still be a feat hitting a bullseye with a dart from 160km, but that would be from Sydney to, um, Nowra on the coast. The distance from Sydney to Perth is 4100 km. 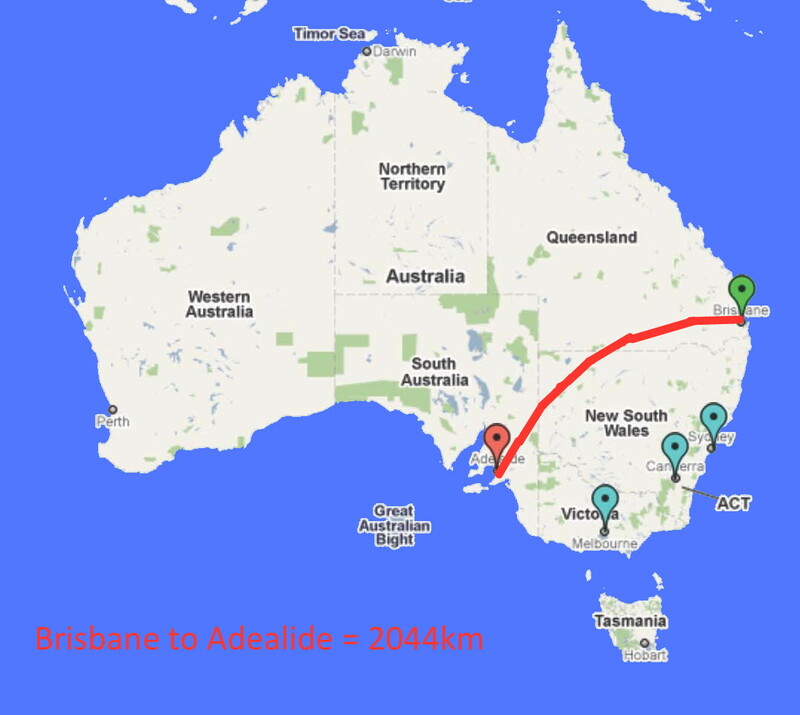 At best the commentators would be talking about throwing a dart from Brisbane to Adelaide is 2044km (below). You are currently browsing the archives for the Rosetta Spacecraft category.